Sitter: The Hon Mrs R.J. Kennedy, née Bertha Jane Ward (1860-1936); 3rd daughter of 5th Viscount Bangor; m (1883) Sir Robert John Kennedy (1851-1936) (KCMG 1913), diplomat. 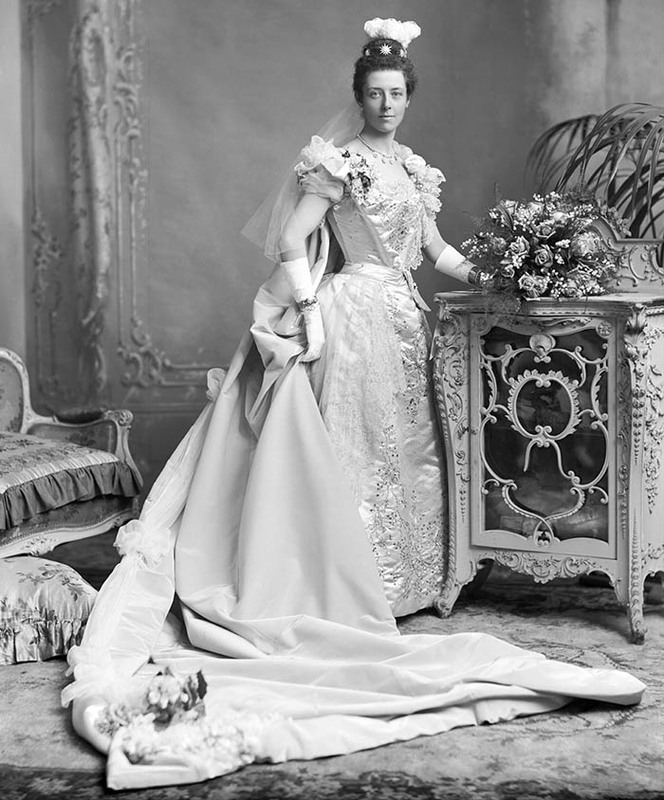 Occasion: The Court, 11 March 1898: presented Mrs. Walter Wilson. Costume: "Court train of rose-pink fleur de velour, lined with cream satin duchesse and black tulle ruches; underdress of rich dove-grey satin duchesse, embroidered in diamonds and silver sequines, with soft folds of old brussels point across the front, and pink velvet trimmings; Court plume and lappets" (see: The Court Circular, 13 March 1898, p 241b)." Costume Supplier: Mme. Emily Williams, 44 Dover Street, London, W.
Furniture & Props: Rococo-style painted backdrop; Louis XV style giltwood canapé; Rococo sideboard. Occasion: The Times, 12 March 1898, p 10a-b. Costume: The Daily News, 12 March 1898, p 6d; The Daily Telegraph, 12 March 1898, p 5b; The Court Circular, 13 March 1898, p 241b; The Gentlewoman, 19 March 1898, p 366a; Lady's Pictorial, 19 March 1898, p 376a; The Queen, 19 March 1898, p 500b; The Ladies' Field, 26 March 1898, p 53b. Costume Supplier: The Gentlewoman, 19 March 1898, p 366a. Reproduced: (version) Lady's Pictorial, 19 March 1898, p 375; (version, with husband) The Ladies' Field, 26 March 1898, front page.